Looking back at building our home in southwest Missouri, I am amazed that someone with no construction experience and limited finances would even consider such an endeavor. What I did have was a lot of energy and an abundance of oak trees in the woodlot. I just needed to convert them to lumber for the passive solar post-and-beam house I had sketched out. Fourteen foot long 8” by 8” posts were not available at the local lumberyard and even if they had been, I only would have been able to afford a couple of them a week. With a rough idea of the design in my head and no local building codes to worry about (no one around here would pay any attention to them anyway), I would cut down a few trees, haul them 15 miles to a local mill, help cut them, bring the lumber home, and add it to the house. That was 30 years ago. My two children, who were in diapers at the time, have grown and moved on with their own lives, and I now have two lovely grandchildren! The house still has a few unfinished places, but has sheltered us admirably through all those years, and thank goodness, continues to do so. As much as I enjoyed helping mill the lumber for the house, the circle mill was too dangerous and too expensive. Portable band sawmills changed all that. A local landowner was so enthusiastic about his mill that he brought it over to demonstrate it. I was hooked before the first board came off the log. The 23-horse Kohler engine was quiet, the band saw blade was safely tucked inside a housing well away from the sawyer, and the cuts were clean and smooth. Once again, boards were coming off of my trees! I located a derelict mill that had been sitting in a pasture for several years. With a lot of repair and assistance from “Henry,” my 1953 8N Ford tractor and “Scotty,” an ’87 Chevy flatbed truck, I was in business for several years, cutting railroad ties and flooring, with the occasional custom job, until the housing downturn. Reluctantly, I mothballed the mill and took a job running a sheet metal press at a factory an hour’s drive away. At a Tree Farm seminar, a sawyer with a small sawmill showed how he could generate more income from the walnut “scrap” left in the woods by loggers than the value of the logs they took out! Watching him transform 8-inch diameter branch wood into oval “cookies” to be sold for plaques got my attention. But when he cut open a fork in a branch to reveal the flame pattern inside, I was convinced. In a matter of minutes, he cut a piece of “scrap” wood into a three-pound chunk that was more valuable than a 300-pound railroad tie! Time for a paradigm shift. The first step was to find a portable sawmill that was better suited to this kind of cutting. The ideal mill would have flexible clamping for odd-shaped pieces, such as forks and short logs, and have a wide enough throat to cut large logs. And I needed to be able to purchase it for less than the selling price of my old sawmill. The Norwood LumberMate Pro MX34 met all my criteria and had a good, solid feel to it. 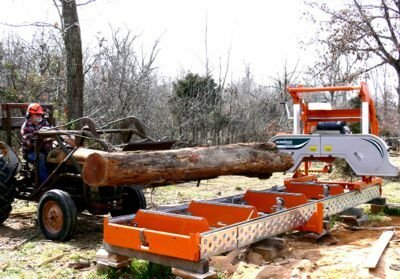 The lack of hydraulic log handling would require more muscle input on my part, but the simplicity of the machine and lower operating and maintenance costs were strong factors in its favor. Besides, I could use the exercise. Manual band mills are inexpensive to operate. I have yet to go through five gallons of gas in a day’s cutting. The sawmill band blades cost around $35, and can be sharpened four or five times for $8 each, before going to the recycle pile. Unless I get into some really dirty logs or hit a nail, I generally cut between 350 and 400 board feet before taking the five minutes required to put on a fresh blade. Fuel and blades cost a total of about $78 for 1,200 board feet cut in a day. Put aside another $15 for maintenance and eventual replacement of the mill, and that comes to about 7.8 cents per board foot operating cost. Now, go to the lumberyard and ask them what 100 2” x 6” x 12’ boards would cost. Then consider the quality, and you’ll understand the economics of owning a portable sawmill. Sawmilling is as much a source of recreation for me as it is a business. It is still a thrill to make that first cut to find out what is inside a log. It is very much, as the great philosopher Forrest Gump once said, “…like a box of choc’lets, you never know what you’re going to get.” The roughest looking logs often have the most interesting grain patterns inside. Even when I’m cutting wood for someone else, I occasionally stop to admire the boards. Walnut crotches, often left in the woods to rot, have a beautiful feathered grain prized for tables and gunstocks. Quarter sawn oak and sycamore have ray flecks that catch the light. Curly maple shimmers with a three-dimensional effect. Cherry, cedar, hickory, ash, and pecan all have their own special qualities. I especially like cutting unusual species like sassafras, mulberry, persimmon, and hedge (Osage orange). Even though I have more wood than I could possibly turn into furniture in my lifetime, I still set aside the best pieces. The independence that comes from producing my own lumber is very satisfying. In addition to my house, I’ve built several sheds, and this is the year we’re going to build frames for raised bed gardens out of some hedge logs I bought from a local firewood cutter. Owning a sawmill helped forge a good relationship with my neighbors. After 40 years, I am still a newcomer here, but they have learned that I cut good quality trailer flooring, barn siding and fencing at a reasonable cost. Every now and then one will drop off a log he thinks I might be able to use, and I’ll load his trailer with slab firewood. One even brought me a quart of wild honey from a bee tree he found. A lot of my recent work has been salvaging and milling logs from trees that had blown down in the May 22, 2011 Joplin, MO tornado, just 18 miles north of my home. Some homeowners want lumber from blown-down trees in what had been their yards. Most have no way to move the logs, and the portability and quick set-up of the small portable mill has been a real asset. A particularly rewarding job was milling post oak logs that grew where the Elks’ lodge had been. The logs weren’t great, and I hit several nails, but the sentimental value is immeasurable. Those boards are currently at a Joplin high school woodworking class where they will be made into furniture for the new lodge. My house still needs a few finishing touches, but I have made good friends along the way. The sawmilling community is helpful and any questions generate a variety of answers. On the Internet, you get perspectives from sawyers around the world. 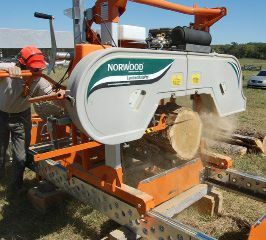 A few of my favorite sites are norwoodsawmills.com, sawmillmag.com, woodweb.com, and forestryforum.com. CUT TO THE CHASE: An abundance of trees isn’t necessary for a sawmill business. A friend of mine has his mill located in downtown Portland, Oregon. He can either bring logs to the mill or, on big jobs, take the mill to where the logs are. This provides his woodworking business with a steady supply of quality lumber, and a stock of lumber for sale to other wood-workers. Most of his wood comes from trees that have been removed by tree services or by the city for roads and developments, and he markets to customers who like the idea of using recycled urban lumber. WHAT TO CUT: As a general rule, I don’t cut ahead or carry inventory. I only cut on shares if I’m pretty sure I can sell my part, or have use for it myself. Still, when someone brings by a load of walnut or cedar, I’ll take my chances! I charge customers based on my time and expense. For example, if the blade runs into metal in a log, the cost of a new blade is added to the bill. Trees from yards are the worst, but even logs from the woods have hardware from old fences, deer stands, and tree houses. I even cut into an ax head one time! INTERNET SALES: The Internet is a tremendous tool for selling lumber, as well as locating suitable logs. You might start with Craigslist or eBay and wind up creating your own website. CUTTING COSTS: I like the fact that I can always adjust the cost of my service. Last Memorial Day, I was cutting for a customer who had served in Korea. He lamented the fact that the Korean War and the people who had served there were largely forgotten. Naturally, I gave him my half-price Memorial Day Veteran’s Discount (I’m the boss… I can do that!). I didn’t make much money that day, but I enjoyed his stories and he appreciated the recognition! OPEN YOUR EYES: If the idea of running a sawmill appeals to you, consider having a local sawyer come over and do some cutting for you, or ask if you can observe the sawmill in action. Most will be more than glad to oblige, if they don’t see you as competition for business. Sawmill & Woodlot Management magazine publishes a buyer’s guide issue, and sponsors the Great Portable Sawmill Shoot-out, in which sawmills run side-by-side. Both are available for viewing at sawmillmag.com.